Space-saving design with lid opening upward. Programmable auto-start for initiating a cycle up to 1 week later. Dual-sensing lid interlock prevents lid opening when chamber is pressurized or when temperature exceeds 97°C. Automatic air purging by a microprocessor prevents over-pressurization during a cycle. One-touch lever to easily open and close chamber lid. Programmable rate of steam exhaust. Door-closure sensor provides a prompt and the cycle will not start unless the door is closed properly. In-process display shows status and progress of sterilization cycle. Agar sterilization mode for sterilizing agar and then automatically maintaining it at liquid temperature. Unique accessory: Floating sensor to monitor load temperature. Sterilization timer is activated only when load temperature reaches set temperature. Memory backup system retains user-programmed parameters even in case of power failure. 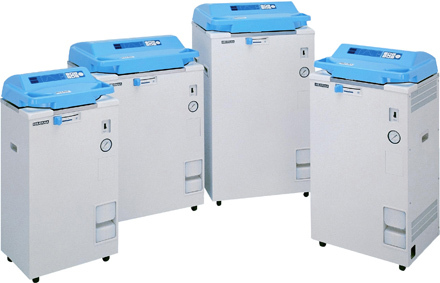 For autoclave accessories, click here. Copyright © 2014 Amerex Instruments, Inc. All Rights Reserved.